Monitoring and control of microstructure evolution in metal processing is essential in developing the right properties in a metal. Microstructure evolution in metal forming processes summarises the wealth of recent research on the mechanisms, modelling and control of microstructure evolution during metal forming processes. Part one reviews the general principles involved in understanding and controlling microstructure evolution in metal forming. Techniques for modelling microstructure and optimising processes are explored, along with recrystallisation, grain growth, and severe plastic deformation. Microstructure evolution in the processing of steel is the focus of part two, which reviews the modelling of phase transformations in steel, unified constitutive equations and work hardening in microalloyed steels. Part three examines microstructure evolution in the processing of other metals, including ageing behaviour in the processing of aluminium and microstructure control in processing nickel, titanium and other special alloys. 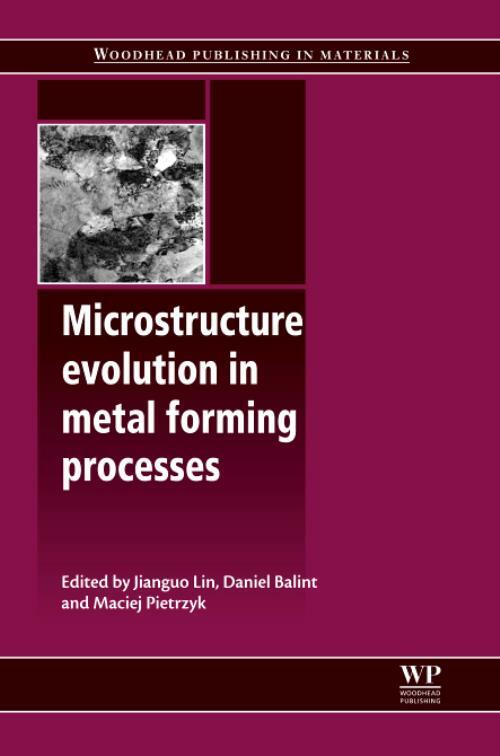 With its distinguished editors and international team of expert contributors, Microstructure evolution in metal forming processes is an invaluable reference tool for metal processors and those using steels and other metals, as well as an essential guide for academics and students involved in fundamental metal research. Lin, JJianguo Lin is Professor of Mechanics of Materials in the Department of Mechanical Engineering at Imperial College London, UK. Balint, DDaniel Balint is a Lecturer in the Department of Mechanical Engineering at Imperial College London, UK. Pietrzyk, MMaciej Pietrzyk is Professor of Metallurgy and Materials Science and Head of the Department of Applied Computational Science and Modelling at the AGH University of Science and Technology, Poland.